Like most machines, automated weather stations require regular maintenance to provide you with better performance and longer life expectancy. 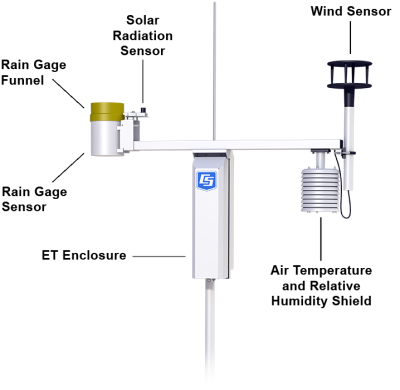 A weather station designed to calculate evapotranspiration (ET) for commercial agriculture and irrigation scheduling has a number of components that require maintenance and calibration. 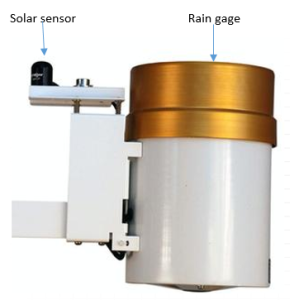 Based on general recommended intervals, this article highlights eight common components of your ET106 or ET107 evapotranspiration weather station that should be regularly maintained or calibrated. 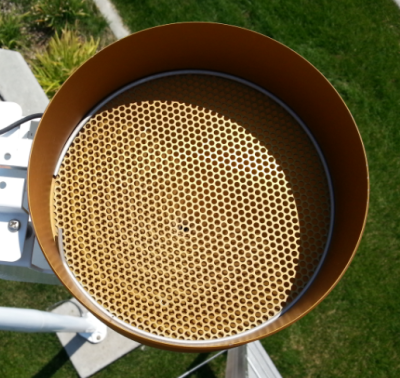 Once a month, inspect the solar radiation sensor (for example, the CS305-ETM). As needed, clean it using a soft, clean, damp cloth. If necessary, adjust the sensor to ensure it is level. Once every three years, have the solar radiation sensor calibrated. For this calibration service, you will need to remove the sensor and send it to Campbell Scientific, which requires a Returned Material Authorization (RMA). To obtain an RMA, follow the steps on the Repair and Calibration page. Recommended for You: To check your solar radiation measurements and see if your sensor needs calibration, read the “How to Check the Accuracy of Your Solar Radiation Measurements” blog article. Once every five years, have the rain gage sensor (for example, the TE525-ET) calibrated. You will need to remove the sensor and return it to Campbell Scientific for calibration. To acquire the necessary Returned Material Authorization (RMA), follow the steps on the Repair and Calibration page. Slide the funnel up and off the white bucket. Rinse the funnel using a water hose. Reinstall the funnel by sliding it down onto the white bucket. Once every three months, clean the temperature/RH (radiation) shield using a soft, clean, damp cloth. Remove the two screws that hold the shield to the bottom of the crossarm, and gently lower the assembly. Set the screws aside. Gently pull the temperature/RH sensor out from inside the shield. Allow the sensor to hang from the crossarm. Clean the shield in a bucket of soapy water using a soft brush. Rinse the shield with a water hose. Allow the shield to dry completely. Reassemble the shield onto the temperature/RH sensor and crossarm by screwing in the two screws. Gently pull the temperature/RH sensor out from inside the shield. Set the shield aside. On the sensor, thread off the “Protective Cap and Filter,” as labeled in the diagram. The RH chip is plugged into the sensor. Remove it by pulling on it. Set the old chip aside. Plug the new chip into the sensor. 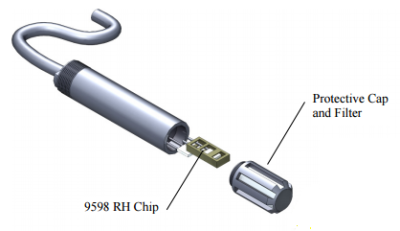 Caution: Do not touch the shiny metal part of the new RH chip with your fingers, as this will damage the chip and result in inaccurate RH measurements. Only touch the chip’s plastic housing during replacement. Thread the “Protective Cap and Filter” onto the sensor. Place the temperature/RH sensor inside the shield. Replace and tighten the two screws that hold the shield to the bottom of the crossarm. An ET station may use one of two different types of wind sensors. Both sensor types are covered in this section. The frequency with which a 034A-ET or 034B-ET sensor needs to be maintained depends upon the environment in which your ET station is located. 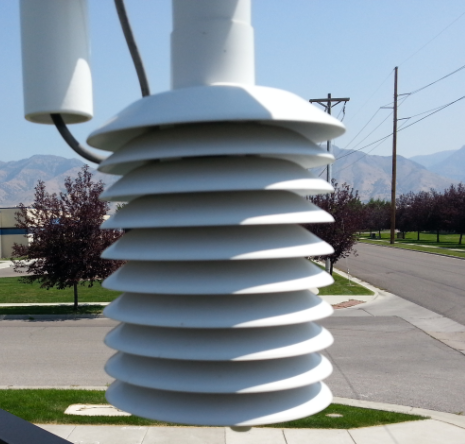 For a windy, dusty environment, the sensor requires maintenance once every six months. 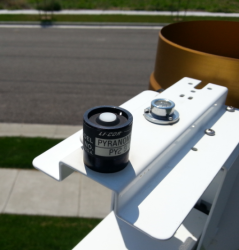 For an environment with a moderate amount of wind, sensor maintenance is required once a year. For an environment with minimal wind, you may only need to perform sensor maintenance once every two years. 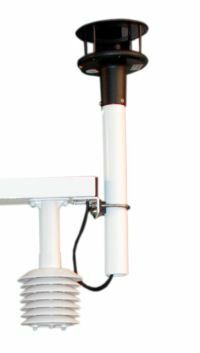 Because maintenance of this sensor often requires replacement of the anemometer bearings, Campbell Scientific recommends returning the sensor to the company’s Service Department. For repair and maintenance information, see our Repair and Calibration page. The WINDSONIC1-ETM requires very little maintenance. Once every six months, clean the sensor with a clean, soft, damp cloth. 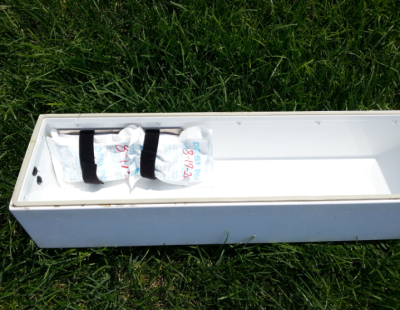 Desiccant packs are typically installed in the enclosure lid of an ET106 or ET107 station, and they should be replaced about once every six months. Two bags of pn 4905 desiccant are used at a time. A 20-pack desiccant option (with 10 packages of two bags each) is also available (pn 6714). Tip: If you use a permanent marker to write the date onto the new desiccant packs when you install them, you’ll have a visual reminder as to when they were last replaced. Once every five years, have the seal on the enclosure replaced. You will need to remove the enclosure assembly and return it to Campbell Scientific for refurbishing and calibration. To acquire the necessary Returned Material Authorization (RMA), follow the steps on the Repair and Calibration page. By providing regular maintenance care for the components of your ET106 or ET107 station, you can benefit from years of accurate evapotranspiration rate calculations. These calculations, in turn, can help you plan and follow an irrigation schedule that provides sufficient water while preventing overwatering. If you have any comments or questions, feel free to post them below.